Is salad dressing hijacking your ‘healthy’ salad? Mustering up the willpower to order a salad when everyone else is ordering a cheeseburger and fries can be a challenging feat. Surely, choosing the healthier option will keep you on track to attain your nutrition goals, right? Maybe. Maybe not. What did you get on top of the salad? Even if you avoid the high-calorie toppings like cheese, meats, candied nuts/fruit, and croutons, the dressing you use could be sabotaging your healthy meal choice. It may be time to re-think your dressing. In a perfect world, we’d enjoy eating salad plain, happily chomping away on raw veggies with no dressing needed. Most people, however, need a dressing of some sort to make their salads a little more flavorful. Healthy salad dressings exist, but they can easily tip into unhealthy territory if you don’t watch how you use them. Like all foods, the key is to pick the right kind of dressing and to watch your portion size. There are two basic types of dressings: oil-based vinaigrettes and cream-based dressings. As a general rule of thumb, you want to stick to oil-based dressings, as the creamier options are typically made with calorie-dense and fat-laden mayonnaise, sour cream, or buttermilk. On the other hand, oil-based dressings are made with heart-healthy fats like olive oil and canola oil. If you are looking to keep your salads from teetering into the unhealthy zone, homemade dressings are almost always healthy salad dressings. In addition, homemade salad dressings couldn’t be easier to make. It takes only minutes to whisk one up, and the ingredients are almost always pantry staples that you already have on hand. When you make your own dressing, you control the fat, calories, and sodium. And nine times out of ten, your homemade version will have significantly less fat and sodium and fewer calories. I don’t know why it took me so long to make my own salad dressing. It was one of those things that I always heard was easy but doubted it every time I heard it. Trust me (someone who considers recipes that have more than five ingredients complicated) when I say, it really is that easy. And much healthier. These days, my two favorite salad dressings are from-scratch, oil-based dressings that only take a few minutes to whip up. This Dijon vinaigrette has four ingredients and pairs well with one of my favorite basic salads: arugula, beets, and goat cheese. This basil vinaigrette would go great with a caprese salad or any other salad topped with fresh, in-season tomatoes. And if you prefer creamier dressings, try this Greek yogurt ranch dressing that is low-calorie but still tasty. Like the consistency of creamy dressings but not the calories? Try avocado or tahini for your base instead of mayonnaise, sour cream, or buttermilk. If you want to reduce calories without sacrificing flavor, try adding some lemon juice, orange juice, apple cider vinegar, garlic, herbs, mustard, scallions, or shallots. Whisk your dressing just before using it to make sure the ingredients are emulsified together. Sometimes it isn’t realistic to make your own dressing and you need to grab a bottle of something from the store. These days, there are dozens and dozens of options to choose from. So how can you tell the healthy salad dressings from the unhealthy ones? Choose a dressing with the shortest list of recognizable ingredients. Skip the low-calorie or light dressings. Light dressings may have fewer calories and less fat, but the calories and fat are often replaced with sodium, high-fructose corn syrup, or sugar to add flavor. Pick an oil-based vinaigrette over creamy options. Creamy salad dressings are usually made with mayonnaise, sour cream, egg yolks, and added sugar. As a result, they are high in saturated fat and calories. These are the types of dressing that are going to sabotage your otherwise healthy salad. 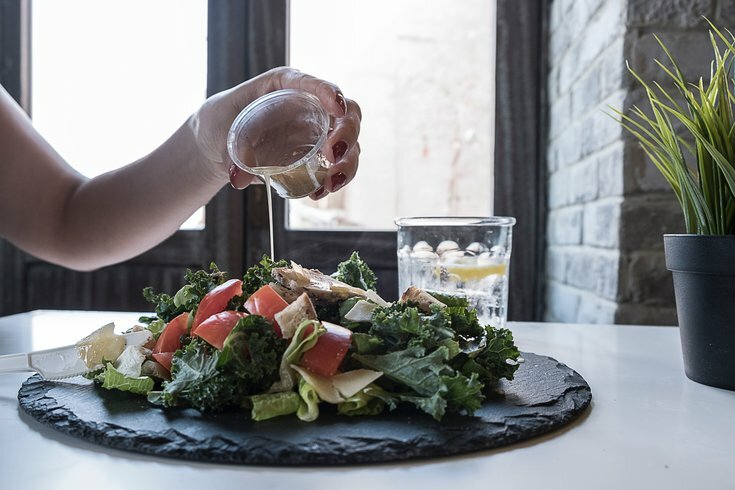 The standard serving size for salad dressing is two tablespoons, which, depending on the dressing, can definitely do some damage. For example, two tablespoons of store-bought creamy Caesar salad dressing contain 170 calories and 18 grams of fat! Oil-based dressings can also be tricky. Even though they are generally healthier than creamy dressings, vinaigrette recipes call for three parts oil to one part vinegar, so naturally they will be high in calories. This is why it’s important to ensure you are only using one portion, even with oil-based dressings. To keep portion sizes in check, opt for spritzer-top bottles or consider dipping your salad into the dressing instead of pouring it, as you will use less dressing that way. If you want to learn more about how to keep your salads (and other meals) healthy, check out our upcoming Healthy Cooking classes. If you’re an IBX member, you may be covered for six free annual visits with a registered dietitian. Check to see if your plan covers nutrition counseling. To find a participating registered dietitian, primary care provider, or another network provider, Independence Blue Cross members can search our Provider Finder Tool or call 1-800-ASK-BLUE (1-800-275-2583) (TTY: 711). This content was originally published on IBX Insights. I’m a writer and bookworm who loves learning and writing about the latest health and wellness topics. Like a true Gemini, I’m a walking dichotomy. I like kale, broccoli, and Brussels sprouts, but I also like ice cream, fried chicken, and cheese. So, I’m always fighting the good fight. As the mom of two little girls, I strive to model healthy habits that my daughters will carry with them for life.